Chest pneumographs are strain gauges that measure thoracic circumference. They can be constructed simply from a bellows that generates pressure when stretched, or an elastic tube containing mercury that changes electrical resistance when stretched. They are used principally for qualitative measurements, for example, breathing frequency. Advantages. They are inexpensive, and useful as qualitative measures of ventilation. Disadvantages. These devices are not accurate in subjects who are moving or whose breathing movements are not stereotypical. The first device to be used routinely for quantitative measurements of chest wall displacements was the respiratory magnetometer (11), which uses pairs of small electromagnetic coils fixed to the skin to measure anteroposterior or other diameters of rib cage or abdomen. Advantages. These electronic calipers are precise, accurate, and consistent, allowing repeated measurements in an individual over many days (12). Also, because they measure diameters (intercoil distance), they are useful for documenting distortions of the chest wall shape as during asthma attacks (13) or forceful respiratory efforts (14). They are also useful for measuring ventilation at rest. Disadvantages. Conversely, when thoracic shape distortions occur, the respiratory magnetometer becomes less accurate in measuring overall chest wall volume. Whereas during quiet breathing, one rib cage and one abdominal signal are adequate to describe chest wall displacements and lung volume changes, during forceful or unusual respiratory efforts, changes occur in the ellipticity of the rib cage cross-section and in the relative displacements of cephalic and caudal regions of the rib cage, making a single diameter inadequate for assessment of volume displacement. In such circumstances, the addition of a transverse diameter measurement can improve volumetric accuracy (13). In all applications, the orientation of the electromagnetic coils should be controlled to keep the axes of paired coils parallel to each other to avoid errors caused by pitch and yaw. For transverse diameter measurements, in which the sides of the rib cage are not parallel, the coils may be fixed to lightweight calipers and held against the body wall by adhesive tape to maintain coil orientation (13). Displacements of the integument and soft tissues can introduce artifactual signals in obese subjects at rest and in all subjects during running, moving in bed, and so on, and thus the devices are less useful in these cases. Another device that has gained acceptance since its introduction more than 15 years ago is the respiratory inductive plethysmograph (RIP), which uses two elastic bands that surround the rib cage and abdomen to provide a signal that varies with cross-sectional area. The RIP can measure ventilation within about ± 5% compared with the spirometer, and can reveal the relative contributions of rib cage and abdomen to breathing. This device is widely used to monitor ventilation. Figure 4. Konno-Mead diagram. Ordinate: Displacement of the rib cage as measured by magnetometers or RIP. Abscissa: Displacement of the abdominal wall. FRC = functional residual capacity, relaxed; TLC = total lung capacity, relaxed against closed airway. 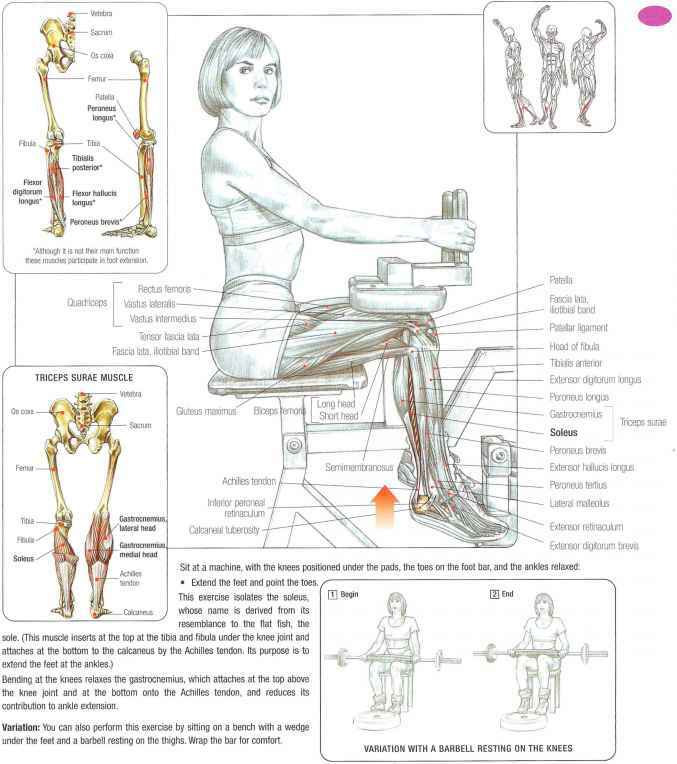 TLC-FRC line indicates slow expiration against resistance, with muscles relaxed. Isovolume indicates the changes in configuration by voluntarily contracting the abdominal muscles while relaxing the rib cage with the glottis closed. 1L = Volume separating two isovolume lines. The volume/distance ratio allows calibration. Each point within the diagram represents a unique configuration (muscle length, diaphragm curvature) of the inspiratory muscles. 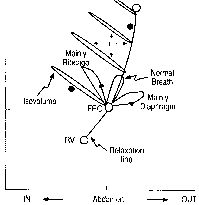 Loops indicate a tidal breath taken from FRC, mainly by using rib cage muscles, mainly diaphragm, or both. Filled circles: Three configurations at which static inspiratory efforts were made as shown in Figure 7 (see Inferring Diaphragm Activation and Electromechanical Effectiveness from EMG). Advantages. The RIP is easy to use. Because the belts encircle a large part of the rib cage and abdomen, integumental mobility and cross-sectional shape distortions are less problematic than with magnetometers, and therefore the RlP is often used during sleep or exercise. The RIP is more accurate than magnetometers in estimating lung volume change (15), perhaps because its signal varies with cross-sectional area and samples a larger part of the moving chest wall than do magnetometers. Disadvantages. The RIP measures changes relative to an unknown baseline, and its accuracy depends on lung volume calibration at the time of study (see below). In addition, movement of the belts or changing body position can affect calibration. Calibration of RIP and magnetometers. Numerous methods for calibrating the magnetometer and RIP signals for estimating lung volume displacement have been described. All methods determine coefficients for rib cage and abdominal signals, and most require simultaneous spirometric measurements of lung volume change during periods of breathing in which the contributions of rib cage and abdomen to tidal volume vary. In the method described by Konno and Mead (Figure 4), the volume-motion coefficients of rib cage and abdomen are established by having subjects perform an isovolume maneuver at two volumes that differ by a known amount. Volume calibration is accomplished by extending the isovolume lines to the axes, where they indicate the known volume difference. Calibration can also be accomplished by using statistical techniques based on tidal breathing without isovolume maneuvers, and semiautomated procedures and computer programs incorporated into some commercial devices can simplify calibration in practice. Alternatively, one can assume a standard ratio of the volume-motion coefficients of rib cage and abdomen instead of finding the ratio experimentally, and calibrating the combined signal with a spirometer (16). The use of a standard gain ratio when measuring tidal volume is probably as accurate as more elaborate methods of calibration and, importantly, avoids extreme errors in calibration that can occur with untrained subjects. We recommend use of standard ratios for measuring tidal volume, especially in untrained subjects. Another device, the respiratory area flux meter, also uses expandable coils that surround the rib cage and abdomen, but in this case the subject must also lie within large fixed-field coils mounted in a frame (17). Advantages. The principal advantage of the area flux meter is that it measures the cross-sectional areas of the rib cage and abdomen accurately. Disadvantages. Although promising, this technique has not yet been widely applied. The necessity for large field coils may relegate this device to research applications.